The PMRC, formed in 1984, are the committee responsible for the introduction of Parental Advisory stickers on CD covers. The committee was formed by the 'Washington Wives'; four women who are also married to members of government, most notably Al Gore's wife, Tipper Gore. Musician Frank Zappa strongly opposed this form of censorship and sent the following letter (and others) to all members of his fan club. Here is the package we have prepared to assist you in any local effort you care to initiate in opposition THE WIVES OF BIG BROTHER and their dangerous program. 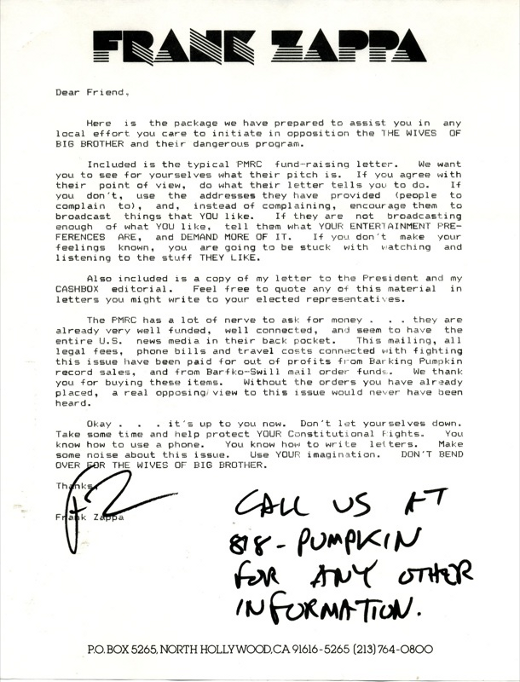 Included is the typical PMRC fund-raising letter. We want you to see for yourselves what their pitch is. If you agree with their point of view, do what their letter tells you to do. If you don't, use the addresses they have provided (people to complain to), and, instead of complaining, encourage them to broadcast things that YOU like. If they are not broadcasting enough of what YOU like, tell them what YOUR ENTERTAINMENT PREFERENCES ARE, and DEMAND MORE OF IT. If you don't make your feelings known, you are going to be stuck with watching and listening to the stuff THEY LIKE. The PMRC has a lot of nerve to ask for money ... they are already very well funded, well connected, and seem to have the entire U.S. news media in their back pocket. This mailing, all legal fees, phone bills and travel costs connected with fighting this issue have been paid for out of profits from Barking Pumpkin record sales, and from Barfko-Swill mail order funds. We thank you for buying these items. Without the orders you have already placed, a real opposing view to this issue would never have been heard. Okay ... it's up to you now. Don't let yourselves down.. Take some time and help protect YOUR Constitutional Rights. You know how to use a phone. You know how to write letters. Make some noise about this issue. Use YOUR imagination. DON'T BEND OVER FOR THE WIVES OF BIG BROTHER.